Santa Clara, United States, October 30, 2013 – Today at the ARM TechCon conference, German video IP and solution provider videantis announced its computer vision partner program, including its first three partners: ViNotion, PathPartner, and nViso. Augmented reality, gesture interfaces, and automotive driver assistance systems enable novel user experiences, safer rides, and new usage models, but require a power-efficient architecture and many billions of operations per second of processing. 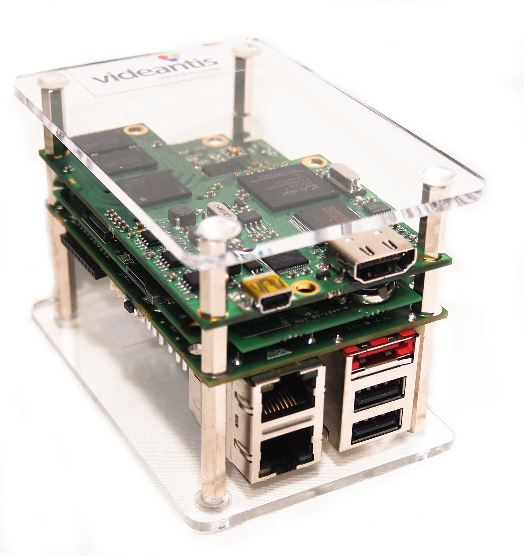 Videantis delivers this low-power, high-performance processing solution in its v-MP4000HDX scalable unified video/vision processor, enabling a slew of new computer vision applications for mobile, automotive, consumer electronics, and surveillance applications. nViso (www.nviso.ch) is a leading provider of emotion recognition software that interprets human facial micro-expressions and eye movements captured through video. Its solutions use proprietary 3D facial imaging technology with artificial intelligence to track hundreds of different facial points and recognize human emotions. ViNotion (www.vinotion.com) is specialized in intelligent image interpretation in videos for the recognition of objects, with applications in video surveillance and people counting. In addition to its standard products, ViNotion also develops custom-made vision solutions. PathPartner (www.pathpartnertech.com) possesses in-depth experience in the development of video analytics and vision algorithms for several markets including video security, retail, automotive vision, industrial automation, and home security and automation. “Advanced video processing capabilities have long been a key component of many SoC devices. Videantis takes this to a whole new level with the ability to efficiently accelerate advanced real time computer vision based algorithms with ultra-low power, enabling a raft of new “always-on” intelligent video systems,” says Tim Llewellynn, CEO of nViso. The v-MP4000HDX processor architecture accelerates OpenCV, the de facto open computer vision library that has been downloaded over six million times and is widely used in both academia and industry. This acceleration results in a 100x speedup compared to running on the host CPU, and power consumption that’s often 1000x lower. As a result, the v-MP4000HDX supports full HD vision processing on battery-operated devices, allowing for more accurate algorithms and an overall higher-quality user experience. The v-MP4280HDX subsystem performs 192 sixteen-bit pixel operations per cycle, 24 on each of its eight VLIW media processors. The subsystem is also silicon area efficient: occupying well under 2 mm2 of silicon in 28-nm technology, including memories. Thanks to its flexible architecture, the subsystem can run proprietary computer vision libraries instead of OpenCV. It can also simultaneously run video and imaging codecs. The v-MP4000HDX scalable processor IP core, optimized OpenCV library, and suite of additional video codecs are now available for licensing. A development and evaluation system is available that includes a 40-nm implementation of the v-MP4280HDX processor at 400MHz, a 1-GHz ARM host CPU, camera input, HDMI output, USB, and networking.